This was just silly; I don’t know how I let myself get into this situation. 3 weeks before running the Cactus Rose 50 mile race, I realized for the third time that my shoes were just not going to work. This last pair of shoes (Saucony Kinvara TR, for the record), just like the two before it, had begun falling apart within weeks. I was really worried now that if I didn’t get a good pair of shoes, and soon, I would be stuck with running the race in unfamiliar shoes, risking blisters, neuromas, and other foot maladies that could make for a long day out in Bandera. I knew I had to get it right with the next pair of shoes, because with taper coming up I was running out of time to test the shoes and break them in. The Cactus Rose course in Bandera is chock full of loose, crumbling limestone, and although it doesn’t gain much in sheer elevation compared to the mountain races in Colorado, it is often going up and down really loose, rocky, cactus-covered terrain where you don’t want to take a fall. It is a technical course, with some decent climbs and descents, yet good portions of flats and rolling hills where you can let loose. 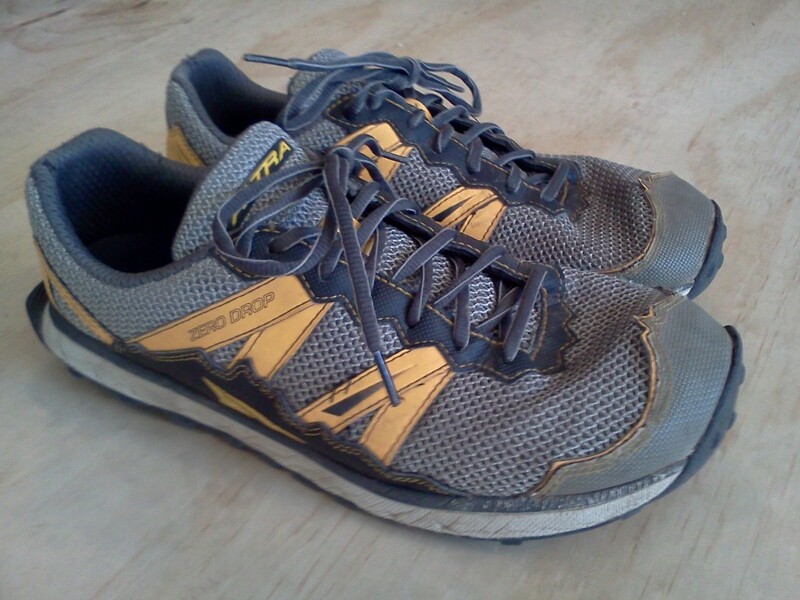 I was looking for a shoe that was comfortable over long distance, protective, grippy, and lightweight. I had to choose quickly, and choose well, or else I’d have to run in my old-and-busted shoes from last season. Altra is known for Zero Drop from heel to toe. I was a little concerned that I wouldn’t have enough time to adapt to the “zero drop” platform, and that the shoe would be too minimalist for the rocky course. I packed a spare pair of shoes at my midway drop bag, but I didn’t need them. The Altras worked really well for the course, keeping my feet comfortable and well cushioned over every last rock. The outsole wears down quickly, leaving a smooth surface. Click for larger image. The Altras really shine for this kind of race, but they don’t seem to hold up well in the long term. 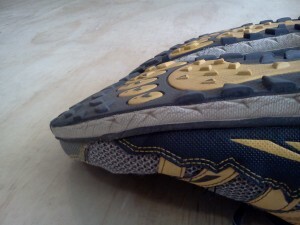 A few weeks after the race ended I realized the tread was nearly worn smooth on the outer edges of the sole. I still wear them anyway, but they are really prone to slipping on loose grit over rock. Another bummer is that the heel is completely floppy; there’s really no structure to the heel at all beyond mesh fabric. It’s not a big deal if you’re just running along, but when hiking, and on steep uphills and downhills, the shoes feel like they’re squirming around underneath my heels. It’s never caused me to wipe out, but it’s distracting and I feel like it slows me down on the downhills. The heel is just mesh fabric with a bit of yellow plastic. On the bright side, the roomy toe box is really nice (happy toes! 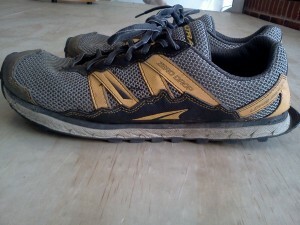 ), the shoe breathes very well, and it is really surprisingly comfortable, even over longer runs. The zero-drop platform ended up being a non-issue; I was running with a 4mm drop and didn’t feel much of a difference when running or in recovery. Surprisingly, with the thin-moderate cushioning in the midsole, they even feel decent on the pavement. This shoe has a reputation as being for minimalists only, but on my feet they feel like a really nice all-around pair of trail runners. However, for the price of the Altras ($110 retail) I was hoping for a shoe that I could use for both racing and training for several months. I could learn to live with the odd fit in the heel, but the quick-wearing outsole is really not acceptable for the steep, rocky terrain I like to run. I will probably put ice screws in the pair I have and use them as a winter training shoe, but look for another shoe for general training and racing. 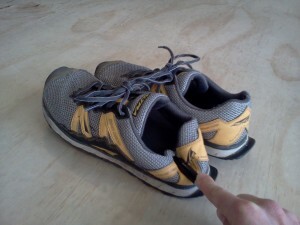 This entry was posted in athletics and tagged athletics, gear, shoes, trail running by admin. Bookmark the permalink.